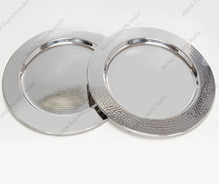 These enchanting collection of trays and platters come crafted using fine quality stainless steel and carry on them bright shine and comfortable usage support. Made available in easy to clean and maintain finishes, these are also scratch resistant as well as safe being cleaned using dishwasher support. The flawless construction support also ensures these do not chip or dent on normal usage. Highlight your upscale affair with this intricately designed steel fruit platter with design pattern in middle. 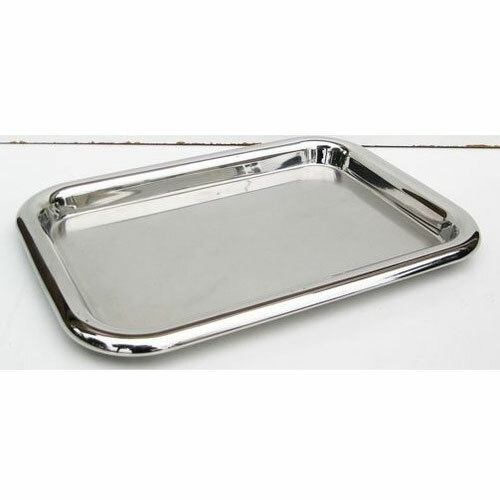 The broad rim of the platter provides added comfort for serving your guests. 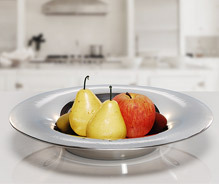 Easy to clean and maintain, this steel fruit platter is scratch resistant and dishwasher safe. 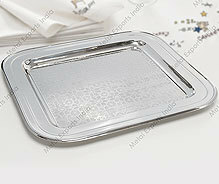 MXMS 01 Stainless Steel Fruit Platter with design pattern in middle. This exquisitely designed fruit tray with beautiful hammered pattern with broad rims that makes serving much easier. Use of quality material makes it perfect for demanding stress of restaurants or for special occasions at home. The platter will not break, chip, crack or dent and will never rust or tarnish. This decorative hand hammered charger plate is designed to blend beautifully with contemporary as well as traditional decor. The flared rims of the plate make the serving a real fun. Dishwasher safe and easy to clean. Imagine a striking center piece decorated with seasonal fruits that perfectly matches the dinnerware settings on the table. This wide footed fruit bowl is made from heavy gauge steel with flawless finish. The flaunting curves and clean cuts make a sophisticated design with lasting looks.